Cáncer de mama: ¿por qué integrar la detección temprana con las intervenciones en salud reproductiva en países en vías de desarrollo? Breast cancer: why link early detection to reproductive health interventions in developing countries? Breast cancer is an emerging challenge on the horizon and is fast becoming a new frontier for women's health in the developing world. While the health problems of underdevelopment are clearly concentrated among the poor, breast cancer is affecting adult women of all economic levels and in both pre- and post-menopausal stages of life. Thus, poor women face a double burden -they are still exposed to, and dying from, the diseases and health problems of underdevelopment, and at the same time are increasingly facing high rates of chronic illnesses associated with changing lifestyles and disease patterns. The health burden of poor women is painfully illustrated by the concentration of persistent maternal mortality,2 high HIV/AIDS prevalence rates,3 and cervical and breast cancer4,5 among women of reproductive age. The magnitude of the threat to women's health in developing countries from breast cancer is largely unknown. Breast cancer is often mistakenly deemed a disease of high-income countries and wealthy women. Recent evidence shows that breast cancer is on the rise as a cause of mortality among both pre- and post-menopausal women and already represents a major threat to women's health. Due to misconceptions and lack of knowledge, breast cancer has not been sufficiently integrated into broader efforts either on maternal and child health, or on reproductive health. This provides an important opportunity to strengthen efforts to promote early detection and treatment of breast cancer that have been largely ignored to date. The purpose of this article is to bring attention to these opportunities to impact on the health of women by reducing the number of breast cancer deaths and extending life-expectancy after diagnosis. This research is based on a bibliographic review of evidence on key global programs and strategies to promote women's health in the developing world. We reviewed the most recent available data on incidence and mortality from breast cancer worldwide, and what is known of risk factors and preventive strategies. We further explored the extent to which existing global efforts to improve women's health are integrating early detection and treatment of breast cancer. Cervical cancer provides an important contrast to breast cancer and lies somewhere in the middle of the spectrum of the women's health and epidemiological transitions. It may increasingly be considered a disease associated with poverty and lack of access to preventive services. It is a cancer, and thus falls into the realm of chronic illness, but it is now known to be associated with transmission of a virus, can be detected and treated with low-cost procedures in pre-cancerous stages, and is preventable with a vaccine.9 Increasingly, cervical cancer is being seen as a disease of underdevelopment and associated with poverty and lack of access to appropriate reproductive health services. As compared to cervical cancer, breast cancer accounts for a greater proportion of both deaths and Disability Adjusted Life Years (DALYs) lost, on aggregate, for both low and middle income countries and high income countries (Figure 1).24,25 As a share of all cancers, breast cancer accounts for 6.4% of DALYs and 7.4% of deaths on average in lower-income regions, as compared to 7.5% and 9.7% in high-income countries. Cervical cancer accounts for 4.4% of deaths and 5.1% of DALYs in lower income countries, and for a much lower share in high-income countries -only 0.8% and 1.2% respectively. The absolute mortality figures also illustrate these important differences across regions by income level. According to these data, in low and middle income countries a higher total number of deaths occur with 317000 women reported as dying from breast cancer as compared to 218000 deaths from cervical cancer. In high-income countries, 155000 deaths are reported from breast cancer and much fewer -17000- from cervical cancer. Breast cancer accounts for a large proportion of cancer-related morbidity and mortality in all regions of the developing world.24 As shown in figure 2,24,25 as a proportion of all DALYs lost to cancer, breast cancer exceeds cervical and ovarian cancer in all developing world regions except the poorest: sub-Saharan Africa and South Asia.5 In all cases, the proportion of DALYs lost is substantially higher than from ovarian or uterine cancer. Further, the figures for breast cancer also exceed colorectal cancer in all but Europe and Central Asia and East Asia and the Pacific. In Europe and Central Asia, as well as the Middle East and North Africa, breast cancer accounts for three to four times more DALYs lost than cervical cancer, and twice as many in East Asia and the Pacific. 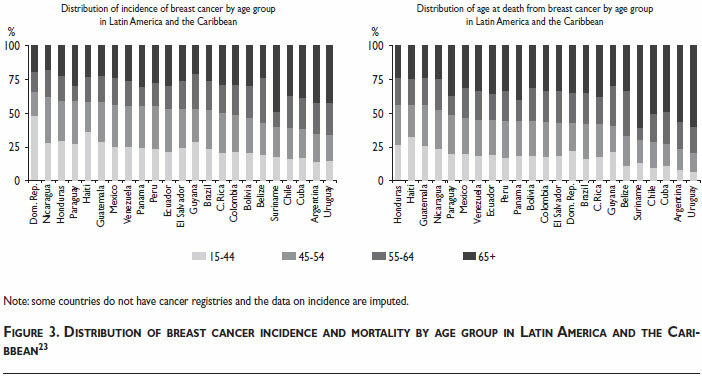 In Latin America and the Caribbean, DALYs lost from breast cancer also exceed cervical although the gap is not as large. Even in the poorest parts of the world -South Asia and sub-Saharan Africa- the proportion of DALYs lost from breast cancer is not very different to cervical cancer. The figures are approximately 10% for cervical and 9% for breast cancer. The findings are similar comparing mortality across regions. The data presented above show that breast cancer is becoming a pressing priority for women's health in the developing world. Informing women about their health and empowering them to take it in their hands is only a first step especially in the case of breast cancer where primary prevention is not possible. Affording treatment and effective early detection for women in poor countries remain significant challenges. Current efforts to improve other areas of women's health provide a number of opportunities for reaching out to young women with messages about breast cancer. Antenatal care visits, as well as contacts with the health system around family planning and child care, offer an invaluable opportunity to provide information on breast cancer to women of reproductive age. Not doing this represents an important missed opportunity to address women's comprehensive needs and illustrates the limitations of vertical programs and the lack of integration with community health and other horizontal initiatives. The question that must be asked and tested in the field is not ´whether´ but rather ´how´ information about and interventions for the early detection of breast cancer -self-examination, annual breast clinical exams, regular mammography after age 40 and careful follow-up from an earlier age of women with family history- can be presented and communicated as part of these types of health care contacts. Initiatives to link these interventions should be tested and evaluated, both in terms of their impact on early detection of breast cancer and on reproductive and maternal and child health. The idea of linking breast cancer detection to antenatal care, and more generally to reproductive and to maternal and child health interventions is an interesting example of the diagonal approach to the organization of health services.34,35 In this case, the vertical approach focusing on a specific disease -breast cancer, is linked to the horizontal approaches of maternal and child and reproductive health interventions. Fifteen years after ICPD, not enough progress has been made on some of the core issues in the Cairo agenda, such as family planning. Official Development Assistance has declined while the need for contraception has increased dramatically. There are an estimated 350 million women and men around the world who want to use family planning but don't have access to it.38 At the same time, other women's health issues included in the Cairo paradigmatic and visionary definition of reproductive health have not yet received the attention and resources that are required to address them in developing countries. 2. Starrs A. Safe motherhood initiative: 20 years and counting. The Lancet, Maternal Survival series; 2006; [ Links ] 2-4. 11. Hidalgo-Miranda A, Jimenez-Sanchez G. Bases Genómicas del Cáncer de Mama: Avances hacia la medicina personalizada. Salud Publica Mex 2009;51: supl [ Links ]2.